So, simple, quick, even for friends coming over to dinner! All you have to do is to buy a nice and good quality puff pastry (but if you are so brave to make it, KUDOS! Just the thought of all that turns make me yawing! ), lay it on the table, sparkle it with cheese of olive paté, fold it in half, cut long thin stripes, then, with each end between the thumb and the index finger of each hand. 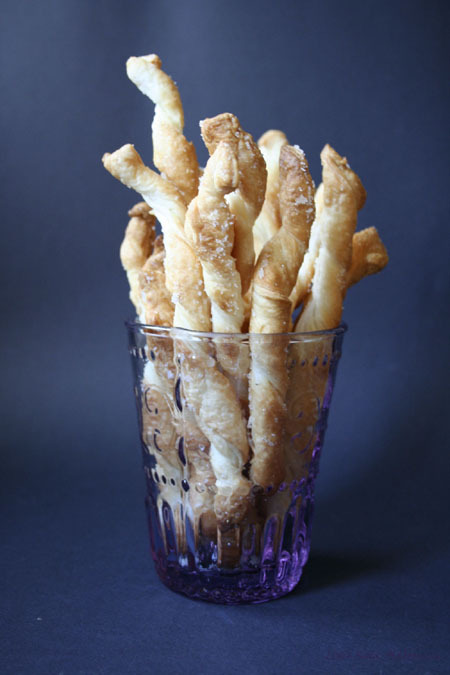 If you are using the fleur de sel, twist them and then sparkle with salt. Oh yum…I like with parmigiano! What a simple and quick idea. Fleur de sel…oh yeah! Indeed it has been hot in Italy, but for us the weather has been just WEIRD! Hot, cold, sunny, cloudy, hail the size of cherries! Some days I don’t know whether I should cook for hot or cool weather since it changes drastically throughout the day. Still, ultimate climes for gelato…the cure-all for freaky summer temps! Those look beautiful, and I bet the smell is amazing while they’re baking! Oh cool, this is a keeper for entertaining.